As CoPilot: - 10 credited missions: Capt/Maj William R. Calhoun (P) - 6 credited missions - 2(A)(18 Nov 42), 3(A), 4, 5, 9(A), 13(A), 14(A), 25, 28, 40, 57; 1Lt Guy H. McClung (P) - 4 credited missions - 19, 20, 33(A), 42, 45. As Pilot: - 12 credited missions: 1Lt Ross C. Bales (CP) - 26; Capt George E. Konsmo (CP) - 32(AS); 1Lt Robert L. Phelps, Jr. (CP) - 36, 41, 43, 47, 48, 51(A), 52, 56, 60; 1Lt Guy H. McClung (CP) - 58; 2Lt Daniel A. Shebeck (CP) - 61 (19 Aug 43). For mission dates and targets see the missions list. (A) Non-Credited aborted mission -- (AS) Credited abortive sortie - no bombs dropped. 1Lt James S. Nix (P) - Was CoPilot on the 359th BS original William R. Calhoun crew . Upgraded from CoPilot to Pilot on orders dated 22 March 1943. First mission as 1st Pilot on 28 March 1943. Alternated as a 1st Pilot and CoPilot on missions 26 thru 47 (28 March thru 29 June 43). 1Lt Nix was Killed in Action on mission 61, 19 August 1943 to Gilze-Rijen, Netherlands in B-17F #42-3192 G-for-George (358th BS) VK-G. Was shot down by enemy fighters halfway between the target and the enemy coast and crashed between Odsterhout and Raamsponkvoor, Netherlands. - MACR 284 (4 KIA / 7 POW). 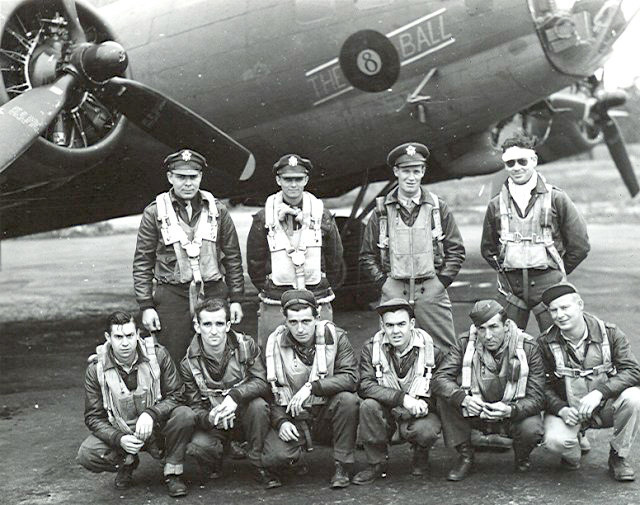 1Lt James S. Nix was flying as Pilot with the following 358th BS crewmen: 2Lt Daniel A. Shebeck (CP)(KIA), 2Lt Dwight M. Curo (N)(POW), 1Lt Robert K. Solverson (B)(KIA), 1Lt Louis T. Moffatt (Passenger)(POW), T/Sgt Frank G. Krajacic (E)(KIA), T/Sgt Curtis O. Brooke (R)(POW), S/Sgt Frank K. Perez (BTG)(POW), S/Sgt Joseph Gross (RWG)(POW), S/Sgt George W. Buck (LWG)(POW), S/Sgt Fred C. Boyd (TG)(POW).